Jacob: Moving to a new church is always scary. Especially when you are trying to plan a wedding. And yet that was exactly the situation that my wife and I found ourselves in almost a year ago. My wife and I met when we were 12-years-old at Seaworld in San Antonio during a homeschool field trip. We started dating when we were about 17. Growing up, I always heard the statistics of how unlikely it is that you will marry your high school crush, but we made it work. Through thick and thin, through trials and tribulations, we made it work. I can confidently say that our relationship was God-ordained because I don’t see how it would have been humanly possible for Ashleigh and I to have made it through all of those years, much less actually end up getting married. And yet here we are, celebrating two months of being married and more in love with each other than we ever have been. This didn’t happen because of chance. Aside from divine intervention, our relationship has stayed strong because of our intentionality. Today, I want to talk about how Faith Church helped with a major aspect of that intentionality. I never thought that marriage mentoring would be something that my wife and I would need, as Ashleigh and I had been together for so long, and we had known each other even longer. After being friends for almost 10 years, and dating for almost 5, you would think that you would know someone pretty well. After moving to Fort Collins and finding a new church home at Faith, my then bride-to-be and I decided that we wanted to get married at Faith and by a pastor at Faith. Long story short we were unable to get married at Faith but we were blessed to have Pastor Grant marry us. When my fiancée and I met with Pastor Grant to talk about getting married, he suggested that we meet weekly with a marriage mentor throughout the course of our wedding planning. At first, I was skeptical, what benefit would we really receive by meeting with a marriage mentor? A stranger who had never met neither me nor Ashleigh and knew nothing of our history? But we went ahead and agreed to meet with the couple that Grant so carefully picked out for us. 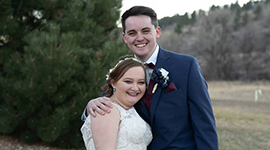 Ashleigh: Jacob and I are so grateful to Grant and to our marriage mentors for walking with us throughout our engagement and now continuing into our marriage. Though Jacob and I believed we had everything figured out at the beginning of our relationship with these wonderful people, I cannot tell you how even more blessed our marriage is because of the marriage mentoring program at Faith. To be honest, after Grant had suggested the marriage mentoring during our meeting, I had told Jacob on the way home that I did not want to do “premarital counseling” because I saw no benefit to it. I was uncomfortable with random strangers looking into our lives and some of my friends back in Texas had gone through premarital counseling and had hated it. What would we learn that we hadn’t already been told by others? What if Faith wouldn’t let us get married because they thought we had stuff to work through? Why would we let complete strangers tell us how to be married when they have no idea who we are? I am so thankful that The Lord softened my heart to go to our first meeting. Our marriage mentors wanted to make sure that we were set on the right course for a healthy marriage by working through major topics like whether or not we want children, who handles finances, family, and healthy ways to argue. The book we were assigned to read, Saving Your Marriage Before It Starts, along with its workbook, was so valuable to our engagement and especially now in our marriage. We also did a (very intensive) survey that really helped them mentor us, and also helped me and Jacob to know the major things we did need to address; things that were quite surprising and neither of us had even thought about. These are all things that our marriage mentors, through the program at Faith, have had training on how to address. The wonderful thing about this ministry is that even though they have a set curriculum and specific topics and issues to cover, they still understand that each couple is unique and work towards specializing their mentoring to fit them. The marriage mentoring ministry is so much more than just premarital counseling; your mentors walk through life with you and encourage you throughout your marriage. We are so excited to continue this mentoring relationship beyond our wedding. If you are newly engaged, or even already married, I definitely recommend looking into this program. Faith is a family, and this program is a great example of what Faith strives to create in ministry: relationship. Marriage mentoring is a relationship between two Christ-centered couples, one of which is a lot more experienced helping the other couple to thrive in their marriage. Jacob: Marriage mentoring was such a blessing for us in our relationship. And it’s so awesome that Faith offers this service freely to couples. I highly encourage you to get connected to a mentor if you are a couple at Faith. Life at Faith is one of community, and marriage mentoring is an amazing way to get plugged into that community. If you are interested in getting connected with a marriage mentor then please contact Pastor Grant at gpahlau@faithchurchfc.org.